Stay in a delightful agriturismo - friendly and family-run with pool, a Headwater favourite! This single-centre self-guided cycling holiday offers a real insight into rural Veneto. It's easy to become enchanted with the idyllic, back-to-nature lifestyle, that doesn't compromise on the comfort and style that genuine Italian country living boasts. The area is excellent for cycling as the valley floor here is criss-crossed with lots of quiet country lanes. We've put together a selection of circular routes of varying lengths, so you can be as active or relaxed as you choose. Further afield, the must-see regional highlights, such as Venice, Vicenza and Padua, can all be reached on a full day out. Or, of course, you can just laze by the pool (typically open June - end Sept only) and soak up the warm Italian sun! Your base for the week is the charming AAA nine-room, Agriturismo l'Albara, nestled just outside the tiny village of Villaganzerla, in the heart of the Venetian countryside. Run by the affable Valfrido and Angelina, their daughter, Romina, and son, Federico, this is one of the friendliest places we've encountered. Don't be surprised if you're invited to take part in fruit picking or whisked away to the local grappa distillery just down the road! The bedrooms here are cheerfully decorated with wrought iron bedsteads, brightly coloured throws and polished wooden floors. The dining room is light and airy and serves fresh, regional cuisine according to what's in season. Everything, even the wine, comes from the farm! This holiday can be booked as a RidePlus option - see itinerary details for routes and distances. Details of the upgraded bikes available and the supplement payable are in the dates and prices section. At time of booking, just request the RidePlus option for the number of people wanting it and before departure you will be sent your route details, with access to downloadable GPX files for you to add to your own Garmin device. Read more about this holiday in Daily Mail. Arrive at your friendly agriturismo in Villaganzerla where you'll be kitted out with a bike and go through the various cycling choices available to you before dinner (time permitting). Sunday is market day (morning only) in Bastia, so we've built in an easy cycle along quiet country lanes criss-crossing the Paduan plain to get you in your stride. Stroll around the stalls before heading off to the tiny village of Lovolo, a charming village square with its ancient lime kiln, for lunch. Your return route takes you through the delightful hamlet of Monticello as you wind your way back to Villaganzerla. RIDE PLUS - 83km / 52mi Today you ride through the Paduan plain to Bastia (market on Sunday mornings). It's an ideal coffee stop before you ride a succession of climbs through the hills of the national park, the Colli Euganei. You're rewarded with stunning views from this unique terrain. The medieval village of Arqua Petrarca, one of Italy's prettiest villages and, long ago, home to the poet Francesco Petrarca, is a good stop for lunch before heading to the historic walled towns of Monselice and Este. Today's route takes you along wonderfully tranquil valley lanes and on to Lake Fimon, a totally undiscovered gem surrounded by shaded woodland. There are lots of little spots for picnicking by the water's edge, or you can take lunch at one of the lakeside trattorie. It's a lovely 5km circular cycle around the lake, before you meander back amidst the green backdrop of lush valleys and rolling hills to your agriturismo. RIDE PLUS - 75km / 47mi Today you head to Lake Fimon, a residual feature from the last Ice Age, where you ascend the Berici hills and into the Berici Archaeological and Natural Park. Dipping into the Strada dei Vini, along the foothills of the Berici hills, you have the possibility of wine tasting at the village of Nanto, locally well known for using the red Tokay grape originating from Hungary. After a lunch stop at Barbarano you cycle back through the vineyards of the Berica plain. RIDE PLUS - 93km / 58mi Start the day crossing the Paduan plain to join the River Bacchiglione into the heart of the historic and UNESCO city of Padova, home of one of the world's first universities and traditionally a centre for leather shoe manufacturing. Here you can view Giotto's fresco dating from the 1300's at the Scrovegni Chapel. You leave Padova along the river Brenta before making your way to your agriturismo for a well-earned locally produced and freshly prepared dish of the day! A cycle path (those feeling lazy can catch the bus) takes you to UNESCO-recognised Vicenza, nicknamed 'Venice of the Terra Firma' for its marvellous architecture. Palladio designed dozens of the city's buildings from the Basilica Palladiana in the main square to the Teatro Olimpico, so there's plenty to explore. On the way home you can visit the famous Villa Rotonda and its surrounding gardens. RIDE PLUS - 120km / 75mi Today's ride takes you to Palladio's city of Vicenza, traditionally the centre for gold jewellery artisans. From Vicenza you ride towards the foothills of the Venetian pre-Alps and into the picturesque medieval walled town of Bassano del Grappa. Enjoy a glass of wine after lunch before heading to Castelfranco. From here you can take the train back to Vicenza. Why not give the bike a rest today and head off to one of the great Italian cities? Venice, Verona and Padua are all accessible by train from Vicenza (short bus or cycle ride). If you prefer to avoid the crowds, perhaps take the bus to Bassano, home to the region's famous grappa and a museum in its honour. RIDE PLUS - 92km / 57mi Your cycle route option today follows the Strada dei Vini along the foothills of the Berician where you will find numerous wine tasting opportunities before heading across to the eastern side of the Colli Euganei where you can cycle the route of the skateboard and inline skate world championships into the pretty hill top village of Teolo. A stop at the Villa dei Vescovi, one of the region's best preserved Villas, is highly recommended. Today, ride past Villa Pigafetta-Camerini, inhabited by the Camerini family since 1700, to Mossano and enjoy the stunning panorama of the Venetian plain. The wine road undulates through the vineyards between the towering Berici Hills and the Paduan plain, offering wonderful vistas on all sides. Turn back north towards the idyllic Franciscan monastery of San Pancrazio before a lovely descent to Ponte di Mossano and a ride along the quiet country lanes of the Paduan plain back to l'Albara. RIDE PLUS - 97km / 60mi A climb over the hills into the Liona region to join the Strada del Recioto, a trail through the vineyards of the Garganega grape that lead you to the walled town of Soave just outside of Verona. Here as well as exploring this beautiful town you can sample the wines that the town so famously gives its name to. You return crossing the vineyards and olive groves of the Birici hills. The Agriturismo L'Albara is situated about 1km from the centre of the tiny village of Villaganzerla in the middle of rural farming land. The area is known for its olive and cherry trees. L'Albara is run by Valfrido, Angelina and their family. They are keen for you to discover the very best that this delightful region has to offer - from must sees around Venetia, to the local cuisine! Everything here comes freshly prepared according to what's in season and the wines come straight from their own vineyards! The bedrooms here are cheerfully decorated with wrought iron bedsteads, bright coloured throws and polished wooden floors. They are all ensuite. The dining room is light and airy, with exposed wooden beams and dark wooden tables with views over the surrounding fields - the perfect setting for your evening meal. 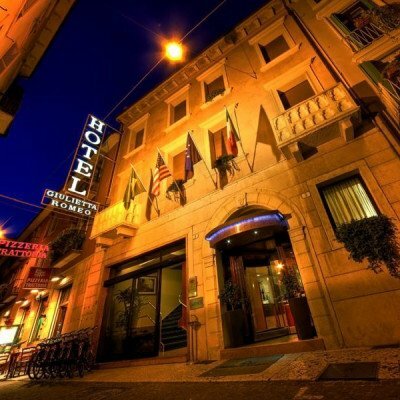 The Giulietta e Romeo hotel, named after the town's most famous lovers, lies in a quiet side street just yards from the Arena. The hotel is fairly modern in style and very comfortable. There is a large lobby area, which leads onto the breakfast room, which is decorated in white with subtle lighting and art deco friezes on the windows. 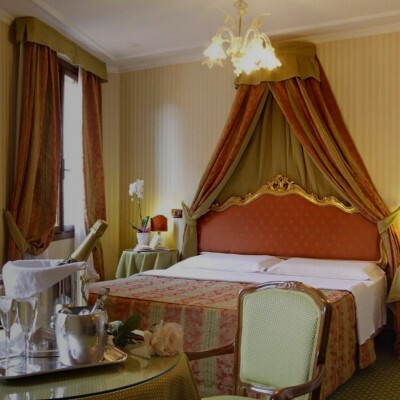 The rooms are all carpeted and traditionally decorated in blue and red decor with cherry wood furniture. They are all en-suite and have double-glazing so there is little noise from the street. A couple of rooms even have the famous Juliet style balcony if you fancy a re-inaction! Parents of under 10 year olds should be aware that some rooms at the Hotel Giulietta e Romeo have a balcony with a step up. Great cycling holday for those that want plenty of excellent scenery without too much effort - routes were easy to follow and a good 1 bike holiday. The only slight downside is the accomodation is quite remote so after the evening meal there is no where to go, but of course lots of chatter about the days experiences with fellow guests. Great holiday overall. L'Albara lovely place to stay, family very welcoming and evening meals and wine delicious. Hannah also very delighted to have cake for breakfast every morning! Transfer from MarcoPolo to Venice mestre and then train to Vincenza quite tiring and a bit stressful. Every Saturday from 27th Apr 2019 to 12th Oct 2019, for 7 nights. All dates are subject to availability, please contact us to check. Road bikes (Ribelle Bike) are available at a supplement of £284 per person. As these are available on a first come first served basis, we recommend early booking to avoid disappointment. Due to the tailor-made nature of our holidays, we need a little more information in order for us to check availability for Heart of Veneto Cycling. Simply complete the form below and a member of our sales team will contact you (when it's most convenient for you) to provide availability information, travel options and an accurate price. Of course there's no obligation, but if you do wish to proceed with a booking they will be on-hand to assist you throughout the process.